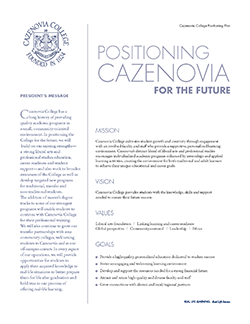 Cazenovia College has a long history of providing quality academic programs in a small, community-oriented environment. In positioning the College for the future, we will build on our existing strengths—a strong liberal arts and professional studies education, career readiness and student support—and also work to broaden awareness of the College as well as develop targeted new programs for traditional, transfer and non-traditional students. The addition of master’s degree tracks to some of our strongest programs will enable students to continue with Cazenovia College for their professional training. We will also continue to grow our transfer partnerships with area community colleges, welcoming students to Cazenovia and at our off-campus centers. In every aspect of our operations, we will provide opportunities for students to apply their acquired knowledge to real-life situations to better prepare them for life after graduation and hold true to our promise of offering real-life learning.